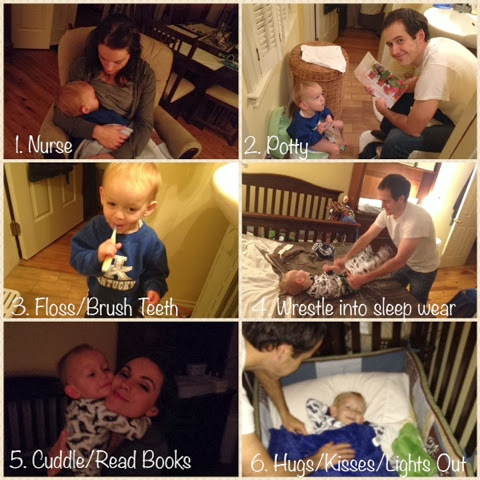 It is time that we let everyone in on our secret to success with Ayden's new sleep habits. A really great friend of mine found a sleep training manual online and was so kind to share it with us. It is called "The Sleep Sense Program" and it worked fur us! If you've been following us since the beginning then you know that we had a rough time with getting Ayden to stay asleep early on. At around 4 months old we moved Ayden to his own room and it eventually got to the point where I was getting up and out of bed every hour because of his frequent night waking. Needless to say, it was having a major negative impact on my life and overall health so we stepped back to reassess. We were following most of the Attachment Parenting (AP) criteria and decided to bypass any sleep training efforts and brought Ayden right into bed with us. This got me *more* sleep and David a bit less but as a whole things were better. We grew to love bed sharing with our little man. It gave David more time to re-connect with Ayden since he is away at work all day every day and we didn't have to leave the comfort of our warm bed for night time parenting tasks. As time passed, though, Ayden still always had a really rough time in the early morning hours and would still wake frequently. He'd make noises loud enough to wake both David and myself and, even if the night was good up until those early morning hours, we'd still wake feeling groggy. David was tired at work, I was tired at home. We had waited patiently for him to grow into being a better sleep and it just didn't seem to be happening any time soon. We decided it was time for us to do something. We tried night weaning alone which went great up until those early morning hours then made those even worse so we went back to our old ways and back to the drawing board. That is when Whitney told us about this really neat method she had discovered. She described it as a sleep training flow chart (or something like that) and that sounded like it was right up our alley. We just felt more comfortable with an if/then plan. After a super rough night, I texted her and asked if she could share the link and we got started that night. At the time, I thought she had discovered a free online program but once I got the email and saw that it was an actual manual, I realized that she must have purchased it. If you are interested in buying it, you can get it here. In a nutshell, the program has two options. One where the parents stay in the room and one where they leave. We chose the former because we just aren't comfortable with leaving him to cry and luckily it worked out for us. We also still room share (his crib is next to our bed) and dodn't have plans on moving him to his own room while we are living here. What set this manual apart from the rest is the "flow chart" feature. It discusses problems that may occur and how to handle them. When we were in the moment we didn't have as many of those, "Is this the right thing?" thoughts because we were able to remind one another, "the book said this might happen, We just have to do ___." David actually did the hard work with this. Since I was Ayden's sleep prop, it was me he cried for which was really hard for me. He cried harder and longer if I was in the room so for the first couple of nights David went solo. I won't lie. The first night was really miserable for all of us. The second night was bad but different, more of a tantrum sounding cry rather than a "What are you all doing to me?!?" cry. Still tough to sit through but not as heart wrenching. By the third night, we hugged him goodnight after reading books and he actually leaned towards his crib, wanting in. David and I looked at each other thinking, "okay... that was too easy" and he quietly lay down and fell right to sleep. It has been that easy ever since. We had a couple of minor set backs around the holidays when the routine and bedtime were all over the place or nonexistent; but he was able to fall right back into the routine once the familiarity returned. We still have one small obstacle of him waking between 4:30 and 5:30 (the book says not to get them up for the day until at least 6am). There have been a couple of nights where he has slept through until 6:10 or 6:30 even but for the most part, it is like clockwork. We think he is hungry and thirsty (he wakes up asking to nurse) but refuses water. We have gotten to where he will go back to sleep, at least for a little while, without crying but we can't seem to get him to stay asleep all the way through. Something that has helped a lot is a light-up alarm clock that we have. We set it so the light would turn on at 6am and tell him, "If it is dark, it is time to sleep. If the light is on, we can get up." If he wakes to find the light is off he does not simply go back to sleep, but it is a nice back up phrase for us when he is asking to get up for the day at 4:30. He also gets VERY excited when he wakes to see that it is on. I will also say that we do see the amazing success in him sleeping straight through from 8 to 4:30. That's eight and a half hours! We just don't go to bed until 10 or 11 so 4:30 does not get us enough sleep. 1) "Do I wish we had done this sooner" - to be honest...no. Ayden is at an age where he can understand what we are telling him and it has helped SO much. We were not comfortable with sleep training early on and always said, "If he doesn't find a better rhythm on his own, we'll wait until we can reason with him before trying again" and that is what we did. 2) "Do we really want him out of our bed?" We really enjoyed a family bed. We loved the cuddles and the warmth. It did not take away from David's and my romantic relationship in any way and it was really nice to be able to take care of Ayden's nighttime needs without having to get up and walk around. We miss it but can see the big picture. It will be best to have him comfortably established in his own sleeping space before baby #2 needs the space in our bed (whenever that time comes). We are very cautious co-sleepers and would not be comfortable with a toddler and a newborn with us both in a queen sized bed. Better do things now so that they are done and we won't have to worry about it when that time comes. 3) "Did we do the right thing?" After the first couple of nights, I wasn't sure. Now? Absolutely! Another good question is, "How has this affected Ayden?" - He is a bit more clingy during the day. I think this just has to do with the fact that he used to get a lot of contact during the night. His tank was filled then, so to speak. Now, he wakes with an empty tank and needs to fill it all day long. I think that is all it is and really do not think it is anything deeper or more serious than that. - He takes earlier and longer naps. He seems to require 13 hours of sleep in a 24 hour period. This was a pattern I noticed a long time ago and wasn't surprised with this new development. Before doing this, he would sleep until 7:30, sometimes 8:00. Now he is waking at 6 (with 1 or 2 wake ups in the wee hours leading up to it). He has to make up for that lost sleep so nap time is when that happens. Even though I am not a morning person and waking up for the day at 6 is not my favorite, I am not complaining about earlier, longer naps in the least. - He now has sleep independence and is proud of it. When he wakes up after a good night he'll say, "I sleep all night long!" and give me a big hug. This shows us that he understands the magnitude of this success and that it was something he wanted too. Shew! This is the longest post I have written in a while, but it was much requested. If you find yourself craving more sleep but just aren't sure how to tackle it, or if you are just looking for a gentle, hands on, sleep training method, I highly recommend the Sleep Sense Program. It really has changed our nighttime lives! I couldn't have done it without David's help so I do not recommend making drastic nighttime changes alone. When you are tired it is easy to forget how important consistency is. We kept each other on track and when one would weaken, the other would give a gentle reminder about what the manual said. It really does take a village. In my opinion, no one can or should do sleep training alone unless you've been able to sleep all day and plan to stay awake and alert all night. Have you used sleep training methods? Did you have any luck? Will you be giving this one a try?? I'd like to give a shout out and special thanks to my girl Whitney!! Without her, we'd still be waking up every three hours with our almost 2 year old (yes, he slept better as a newborn...). In the past month, I have gotten 7 and 8 hour stretches of sleep for the first time in those almost two years. When I put it that way it seems crazy that I was even able to function but somehow my body adapted. Seriously... Thank you, thank you, THANK YOU!!!! Flashback! Here's what we were up to one year ago today: "Sparkly Clean"
Baby #2? Is there something you aren't telling us ;) saw this book and thought of you posted on you fb too. Haha. Ayden is almost 2 so it is on the horizon :). That book looks great, thanks for sharing! I am always on a quest for those things, I've already put a hold request in at the library. I will consider this option with our next baby. Nancy will be turning 2 in April, and she is finally sleeping through the night (as of 2 nights ago). We just recently bought her a queen sized bed that she gets all to herself. I am slowly cutting the nursing before bed. Tonight, I think we'll be the last time. I still stay in the bedroom until she falls asleep, but it's only taking her about 15 minutes to do so. I don't know how I got to this point, but I am happy to have finally reached it. It's whatever works best for you and your child - I truly believe it. I am glad to hear Ayden is getting into a better routine too. Ayden had the same problem. Even though we were laying with him while he fell asleep, we didn't help him by nursing, patting or anything. It was after waking in the middle of the night that he needed help getting back to sleep. Him learning the key phrase worked like a charm. We used it when we first put him down and he got used to it enough to do what we said when we used it in the middle of the night. It is the pattern and consistency of it that works I think. We'd just say, "It's time to sleep" and cover him back up and by the third night he'd go right back to sleep. The first two nights were NOT that easy but he caught on quickly. So sorry I did not respond sooner! Hope this helps. I've been waiting for this :) my son is 21 months old but I don't think he's cognitively ready for your suggestions. He's still nursing like a newborn too :P he also has the restless early morning period. I tried night weaning one time but it doesn't seem worth it in the moment, although as you know, it does when it's over. I'm tired of waking up all night long! So thank you for sharing your method, I'll look at the book! If you end up trying it out, let me know how it goes! Like I said, I would have never been able to make it through the grueling process without help. You are so right when you say it's not easy or worth it in the moment but once you make it through it is glorious! My son was a co sleeper until he was one and then we decided to wean him from night time feedings, so we put his crib beside our bed and he kept waking up frequently I just thought he wanted to nurse, but after a few minutes he would go back to sleep. Well that wasn't working out at all because the purpose of us night weaning was to get more sleep which still wasn't happening! He would wake up every time we coughed or rolled over. So a friend suggested putting his crib back and his room and him sleeping in there. We thought thus will never work! We thought he will be scared to death to sleep alone, but we were willing to try anything at that point. The first night he slept in his own room he only cried for maybe 10 minutes and slept from 8 pm--7:30 am straight through. And every night since then we just do the same bedtime routine and he doesnt fuss about going to sleep and sleeps all night! Turns out he is just an extremely light sleeper and needs total quietness to sleep well. It was us that was making him not sleep good! Ayden will still wake sometimes in the night. He'll go right back to sleep when I cover him back up but still I wonder if he'd sleep better in his own room. We won't be able to try it out until we get moved into our new house but that is the plan once we get there. I really don't want to get up and walk anywhere to take care of nighttime parenting tasks so we'll try it out for a while and if he wakes just as much we'll move him right back in with us. You never know until you try!